Health researchers and practitioners are beginning to warn more strongly that sugar is a major cause of some of our children’s most significant diseases, behavior issues and learning problems. It is even more dangerous than most of us have realized. Sugar is found naturally in various foods, such as milk (lactose) or fruit and honey (fructose). Added or “free” sugars include refined table sugar (sucrose) as well as fruit juice or syrups. Consumption of added sugars often starts during gestation, where fructose and artificial sweeteners eaten by the mother can affect a developing baby in the womb (secondhandsugars.com). After birth, the infant is further hooked through affected breast milk, infant formulas or baby food. Experts warn that children should not consume more than six teaspoons of sugar daily, but 1-to-3-year-olds consume double that amount, 4-to-8-year-olds consume 21 teaspoons daily, and 14-to-18-year-olds consume 34 teaspoons daily, says the National Cancer Institute. The United States Department of Agriculture reports that the average American consumes 150 to 170 pounds of sugar per year. Some common foods—including breakfast cereals, sports drinks, soft drinks and fruit juices—contain more sugar than your average candy bar. It only takes four average 12-ounce cans of sodas to equal a quarter pound of sugar! Many children easily consume this amount daily (bamboocorefitness.com). Sugar immediately floods the intestines and liver with large amounts of loose fructose and takes a devastating toll on children’s health. Yet about 80 percent of all packaged supermarket foods contain some form of additional sweetener, states the Centers for Disease Control and Prevention. Francine Kaufman, director of the Comprehensive Childhood Diabetes Center at Children’s Hospital Los Angeles, says a child with high blood pressure could reach the advanced stage of heart disease, and ultimately a heart attack, as early as age 35 (Parents.com). Nearly 57 percent of children in the U.S. today are destined to be obese by the time they turn 35. The current rate of obesity among adults is 35 to 40 percent (cbc.ca). Type 2 diabetes, once considered an adult-only condition, now runs rampant in obese children. Consuming even one soda per day increases diabetes risk by 85 percent. Mayo Clinic researchers state that added fructose may be the number one cause of diabetes. This disease was the seventh-leading killer in 2015. The link between sugar and cancer is also becoming clearer. A study in Nature Communications shed light on how tumor cells appear to make energy through the rapid breakdown of cellular glucose. Then there’s the link between sugar and the brain. 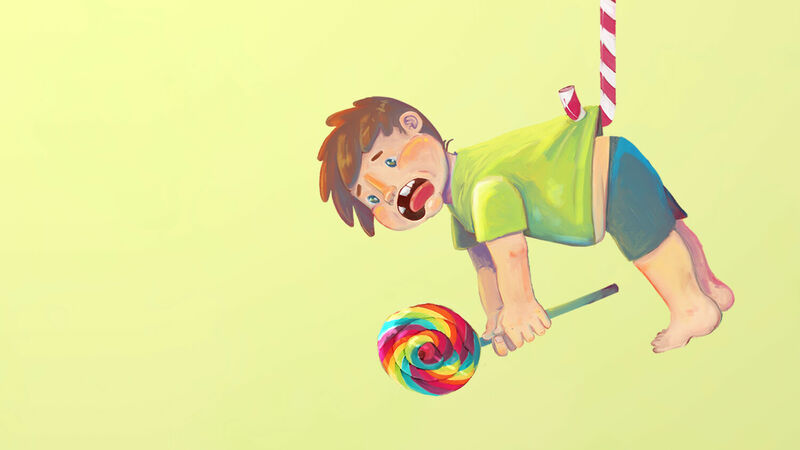 More studies point to refined sugar and increased hyperactivity in children with attention deficit hyperactivity disorder, with kids becoming addicted to the substance like a drug. They suffer mood swings, become overactive and destructive, and endure withdrawal symptoms (British Journal of Sports Medicine). Such addiction can’t happen with sugar from whole foods, such as apples. Their fiber content not only limits how much sugar is eaten, but also how quickly the sugar leaves the intestine and reaches the liver. The body’s enzymes must first tear apart the apple’s cells to reach the sugars sequestered inside, which is a slow process (Scientific American). The Journal of the Academy of Nutrition and Dietetics says adolescents spend $140 billion a year on foods high in sugar and fat, while those under 12 spend another $25 billion and influence another $200 billion in spending. By the time children finish high school, they have spent nearly twice as many hours in front of the television than they have spent in the classroom (about.me/luka.radunovic). Food manufacturers spend $500 million per year advertising their sugary products. The bitter truth is that sophisticated forces are targeting your wallet through your children. Children cannot monitor and restrict their own sugar consumption. It is hard enough for adults to do so. Parents must remain firm and not give in to their children’s pleas for sugary products. If you are committed to your children’s health, try to spend about 90 percent of your food budget on whole foods. Replace sugary snacks with naturally sweet foods like fruits. Replace fruit juice with water containing slices of cucumber, berries or orange. Rather than boxed desserts and snacks, make your own treats flavored with vanilla extract, cinnamon, nutmeg, fresh fruit or almond butter. Eat your meals with your children so that you can show them an example of healthy eating and compel them to eat the healthier foods you serve. Parents must recognize the dangers and act as if our children’s health hangs in the balance—because it does.